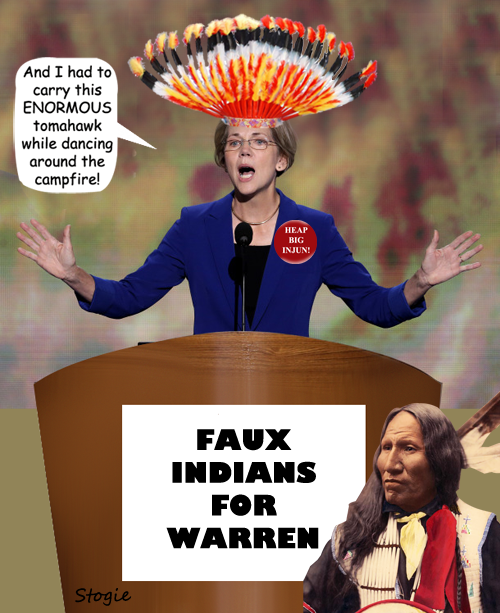 After hearing this "Cherokee-descended" fake speak at the Democrat convention, one can only wonder at the dearth of brain cells among those who support her candidacy. Warren is running against Scott Brown for the Senate seat once held by Ted Kennedy in Massachusetts. Warren is allegedly a "bankruptcy expert," which may come in handy for Massachusetts should they be foolish enough to elect this rabid leftist. Warren has incurred widespread contempt for her fallacious "Cherokee heritage," a meme she created to make herself more palatable to her leftist employers at Harvard, as a "non-white" on staff employee. Cherokees have examined her lineage and deny that she is of Cherokee descent, and have asked her to stop pushing the fraud. What a specious, insubstantial fool.